UMG has been working for over 30 years within the glazing and metalwork industry. We make high quality, bespoke Glass Balustrades and Staircases to suit all types of interiors. Our friendly and professional team work closely with clients in order to achieve exactly what is required. We are with you during every stage, from initial design work right through to the finished project. We aim to make the building process as seamless and as smooth as possible. Below we explain more about our Glass Balustrades and Staircases service. When you decide to incorporate Glass Balustrades or Glass Staircases as part of your office or business setting, then you will be creating the ultimate professional look. The combination of steel and glass is timeless and will not impact upon the rest of your interior décor. In fact, it will easily blend into your surroundings while adding the illusion of extra space. As well as assuring our clients that our glass staircases look the best that they can possibly be, it is also important that they are durable and long lasting. We pride ourselves on making beautiful glass staircases that are suitable for long-term use, and wear and tear. No matter what the footfall usage is, our staircases will stand the test of time, will not age and will look as good as new fifty years into the future. When you want to ensure the safety of both staff and service users, then the glass balustrade is the perfect way in which to do so. As well as oozing pure elegance and sophistication, the glass balustrade creates a feeling of space and will not obscure the view. Coupled with this is the fact that we use toughened safety glass to ensure optimal safety and usability, the glass balustrade is also a subtle way in which to define specific areas. Architects and our team of designers work closely together to create the perfect staircase and balustrades to suit your specific tastes and needs. We can incorporate a range of design features so that they will blend into the surroundings. Usability and aesthetics are carefully combined as we have many years of experience in doing this type of work. We also like to challenge ourselves and are happy to take on board a range of design ideas to help create the desired needs and uses of a specific space. Stairs and balustrades that are made from glass can be used in any size of building. Due to the glass and steel construction, they will not dramatically make the interior space look different, but will rather enhance the look of the building and improve customer satisfaction. We all enjoy looking at glass stars as there is something simply magical about them. That feeling that you are quite literally walking on air. 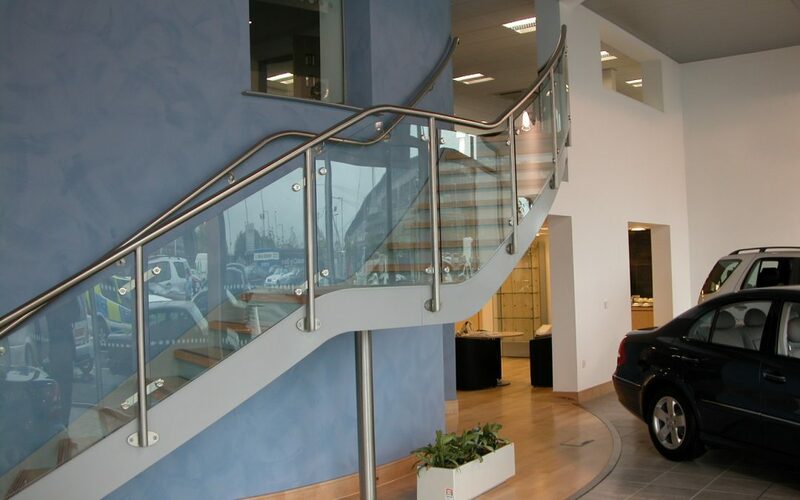 Glass Balustrades and Staircases really do add that professional and sleek look to any building.